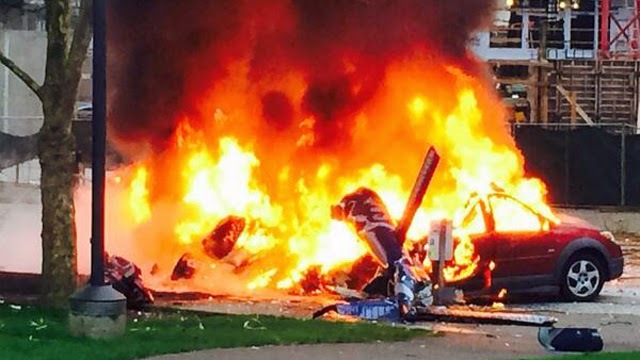 Seattle, WA—Tragedy struck this morning as a TV news helicopter crashed near the landmark Space Needle. At least two people are reported dead and another is listed in critical condition at a local hospital. At least three cars have been set on fire as result of the crash. TV news helicopters have a relatively good safety record, but every few years somewhere, these horrible accidents are repeated. Over the years I’ve lost friends in crashes in Phoenix, AZ and Denver, CO that lost their lives covering news from the air. Trust me, it always hurts. Aerial news coverage is necessary but can be a little risky. It is also the single most expensive cost of most TV news organizations. TV news has lost a major portion of its audience and revenue and many news organizations have curtailed or eliminated helicopter coverage altogether. Technology has brought us something far lass risky or expensive, the camera armed, Unmanned Aerial Vehicle. These devices are very light, inexpensive, safe and perfect for gathering and broadcasting news video. The little drones can cost at little at $1000.00 with the popular high definition GoPro cameras or as much as $15,000 with a larger camera such as the Canon 5D DSLR with live broadcasting capability. Either way it’s only a fraction of the cost of operating a helicopter. The upside is that accidents with quadcopters are nearly always free from damage or injury. They are so light that should they fall from the sky there is little or no damage in most cases. The size of the quadcopters range from a small to an extra large pizza. They can operate as long as 25 minutes before they are brought down for a quick battery change. Those sensational and famous Los Angeles freeway chases are not currently suitable for the quadcopters because they often go on for hours and many miles. In riots helicopters are often shot at from the ground. That’s dangerous to say the least. Quadcopters are a much smaller moving target and lives are not at risk should they be hit by gunfire. A Denver federal judge has just reversed the FAA ban on commercial use of these drones. Use of drones by hobbyists was always allowed but now news organizations are free to employ these devices. I know for sure that employing drones will slow down the steady downpour of pink slips in newsrooms because they are so incredibly cost effective. I can predict the immediate hiring of quadcopter multimedia journalist-pilots that can also edit the raw video into news packages on laptops in their vehicles at various news events. In the long run the use of drones will bring more use or aerial video than the helicopters simply because of the ease and reduced cost involved. Another advantage is the drones can easily operate at much lower altitudes. In fact the FAA wants them no higher than 400 feet. Aerial video from just 30 to 75 feet is truly amazing. The drones can be effectively flown and operated after only a few hours of practice. News organizations cannot afford, not to employ these gee whizz gizmos if they are serious about their mission and financial survival. Below is my first video flight of my Blade 350 quadcopter and GoPro Hero3+ camera. The cost of this bare bones package was about $1000.00. I was able to do this with only about an hour’s instruction and practice. I edited this video on a laptop with Final Cut pro X software.